Looking for discounts at local businesses in Flagstaff? 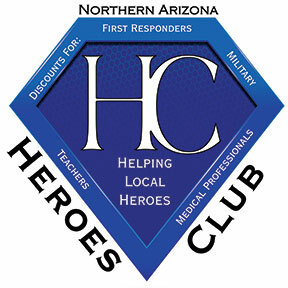 Joining the NAZ Heroes Club gives you access to businesses, discounts and events that want to honor YOU! our local HERO! Becoming a member is FREE! There is no obligation.Click Hero Signup for more info. Joining the NAZ Heroes Club as a VENDOR/LOCAL BUSINESS. We generate additional business for you from local residents. We promote your business through face-to-face interatcion and online marketings. Click Vendor Signup for more info.